New Catalogue + Judd Greenstein. This is a Present from a Small Distant World, 2012; installation view. Courtesy of the Scottsdale Museum of Contemporary Art, Scottsdale. Photo: Dorothy Santos. The New Catalogue artist collective, composed of Mary Voorhees Meehan, Neil Donnelly, Jonathan Sadler, and Luke Batten, collaborated with composer Judd Greenstein to explore humanity, history, memory, space, and the unknown in their exhibition This is a Present from a Small Distant World: New Catalogue + Judd Greenstein, at the Scottsdale Museum of Contemporary Art. When viewers first enter the exhibition space, the large-scale installation is enclosed by two parallel white walls covered with friendly messages written in black bold sans serif type. 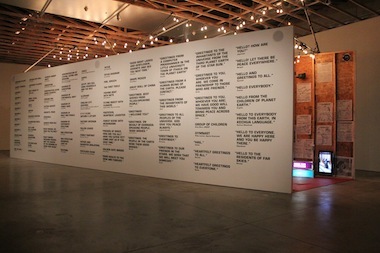 Multicolored light boxes illuminate printed words such as “coffee,” “vinyl cutter,” “advice from a family member,” “string cheese,” and “twenty books.” These are only a small fraction of the humorous, endearing, and poignant answers to questions about communication with extraterrestrial beings. Walking through the red carpeted interior of the makeshift corridor, flat-screen monitors pose questions to the public. Classical music permeates the space. Between the exposed, unpainted, raw wooden beams, questions on newsprint paper invite viewers to participate in an analog discussion. Some of the questions include “What are ten things aliens would need to see/taste/touch/experience to understand life on earth?“; “Which five songs would you bring to space so alien life could understand us?”; and “What do you imagine aliens are like?” Answers to that last question included “Lady Gaga,” “Nikki Minaj,” and “Michael Jackson,” suggesting that some of the most colorful human beings in the public eye are the most foreign and otherworldly. These human observations ask us to consider what would happen if we could transmit and receive communication with alien life. Based on the posted responses, possibilities range from humankind’s greatest accomplishments in the arts and sciences to the sharing of radical and pointed views about our political and social state. The responses also speak to something deeper and more existential. New Catalogue and Greenstein have created a work that reminds viewers of the qualities philosophers and scientists have posited separate humans from other species: the ability to introspect, activate memory, and create awareness. Originally posted to Shotgun Reviews on Art Practical, please click here to view. Posted in Art, Art Writing and Criticism, Culture Criticism, Film, Interactive / Participatory Art, Observations and tagged as Arizona, culture criticism, judd greenstein, language, new catalogue art collective, observation, participatory art, scottsdale, SMoCA. Ha ha. I hope so too. I think whatever word they have for “weird”, that’s probably the way they would describe humans.